As creepy clowns continue to terrorize the nation, one iconic clown has decided to slink into the shadows until this whole thing dies down. Ronald McDonald, hamburger champion, is going incognito. 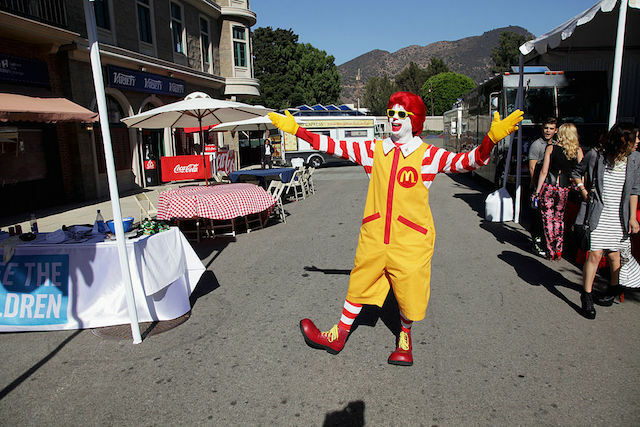 McDonald’s and franchisees in local markets are mindful of the current climate around clown sightings in communities and as such are being thoughtful with respect to Ronald McDonald’s participation in community events for the time being. McDonald’s began in San Bernardino in 1940 as McDonald’s Barbecue Restaurant, and would become simply McDonald’s in 1948. Ronald was not introduced until 1962 as part of a package deal. The company had just sold its millionth burger, and they also brought the Golden Arches that would has become synonymous with the brand today. The first time Ronald was ever featured in a TV commercial, it was pretty weird. He wore a paper tray hat adorned with a packet of fries and a milkshake, and a paper cup for a nose. He kind of looked more like a criminal on the lam who had to quickly don a disguise to evade capture and made a clown costume out of items found in the restaurant&apos;s dry storage area. In 1966, Ronald&apos;s image was altered to look more like the clown we grew up with. In recent years, Ronald has been only sparsely featured in mainstream advertising in favor of other campaigns, but still regularly appears for various events—until now, of course. As silly as it seems for Ronald to go into hiding, it&apos;s probably wise, considering some vigilante clown hunters have been prowling their local towns for any sign of greasepaint. This might remind one of the Hammersmith Ghost Murder. In the early 1800s, the London neighborhood of Hammersmith was under siege from a pernicious ghost, or so several townspeople claimed. They decided that they would send patrols each night to search for and ward off the spirit. One night, ghost hunter Francis Smith was out patrolling when he saw the ghost in the distance. He shot the ghost, killing it, but his victory was short-lived. He hadn&apos;t shot a ghost, but plasterer Thomas Millwood, who was dressed in the white clothes customary to the occupation at the time. At the subsequent trial, a witness testified that she&apos;d warned Millwood not to go out in his plastering clothes in the midst of all the ghost hubbub, but he didn&apos;t listen, because who in their right mind would try to shoot a ghost? For his crimes, Smith was ordered to complete a year of hard labor. And that ghost? Turned out to be some old guy in a white sheet trying to frighten an employee who had been telling his grandchildren ghost stories. Kind of like how most of these creepy clowns are bored teenagers trying to get a rise out of their neighbors.